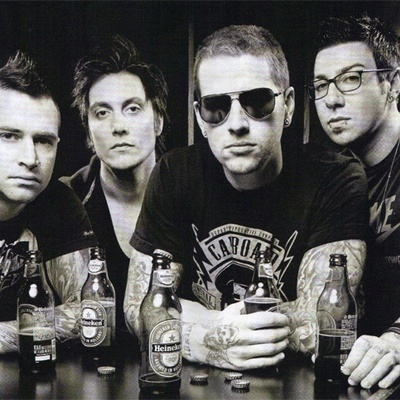 Avenged Sevenfold is a band from Huntington Beach, California, United States. They started out as a metalcore band, but have since moved towards hard rock. The band was formed in 1999. Avenged Sevenfold's first album, Sounding the Seventh Trumpet, was recorded when the band members were eighteen years old. It was originally released on their first label, Good Life Recordings. After lead guitarist Synyster Gates (also known by Brian Haner Jr.) joined the band, the introductory track "To End The Rapture" was re-recorded with Gates playing, and the album was re-released on Hopeless Records.